The FarmPak from Green Energy Systems (GES) is a 5 – 10 kW ground frame mounted solar energy system which has been designed specifically for DIY application by farmers. 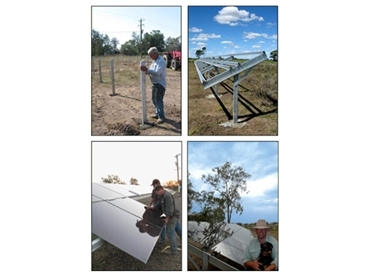 The FarmPak solar energy system incorporates amorphous silicon thin film solar panels which benefit from tolerance to extreme hot climates, such as found in the Australian outback. According to GES these amorphous solar panels can yield up to 25% more power production than other solar technology. The solar energy system is ground mounted for ease of positioning and safe removal of dust when required. The FarmPak has been designed so that the majority of installation can be carried out by the farmer, including the assembly and placement of rails, posts and panels. Only the DC/AC cabling requires grid connection from qualified engineers. The skill level required for installing the FarmPak solar panels is similar to building a fence or shed and can be accomplished in four simple steps. The FarmPak solar panels are available for both 48V off grid systems and grid connected systems. Contact GES for more information on installing the ideal farming solar power solution.